Crossing Vineyard's Blanc de Blancs Champagne: This elegant sparkling wine is made in the traditional m�thode champenoise from 100% Chardonnay grapes. The nose is lightly herbal, and the taste is crisp with hints of toast and cream. Pairs well with a wide variety of foods from appetizers to dessert. igourmet.com Signature Cheese Serving Knife: This multi-function cheese knife is the perfect tool to easily slice uniform servings of your favorite cheeses. 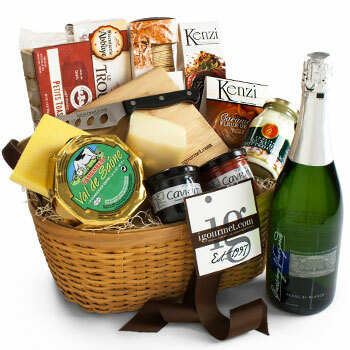 igourmet.com Logo Cutting Board: The inclusion of this cutting board makes it easy to enjoy all of these cheeses the moment your guests receive this basket.